Fish and chips are the quintessential pub food. But with everything on the plate deep fried, it’s not the healthiest dish. Is there a way to enjoy this classic without quitting your diet? Fish and chips is classic comfort food. Is there a healthy way to enjoy of this pub favorite? Fish and chips is a classic British comfort food that has made its way across the pond and onto our plates. It has a beautiful simplicity that often comes with comfort food. You know what also often comes with comfort food? The pounds. Everything in fish and chips is deep fried to fattening perfection. Well, perfection, unless you’re watching your weight. If you’ve been following this series of articles , you’ll know what comes next. But how could we possibly have any tips to make healthy fish and chips? Well, first, we’ll address the elephant in the room. This won’t be your grandpa’s fish and chips. If you want to have a slightly healthier fish and chips, the best swap you can make is the fries. French fried potatoes add a lot of calories to the dish, but there are healthier alternatives. Try giving green beans, zucchinis, or even polenta a try! If you’re set on using potatoes, how can you make them healthier? The trick here is all about how you cook them. Most fries are fried. Shocking, we know. Instead of frying them, baking your fries is a much healthier option. In fact, baking your fries can save around 200 calories per potato! Potatoes aren’t the only fried part of this meal. 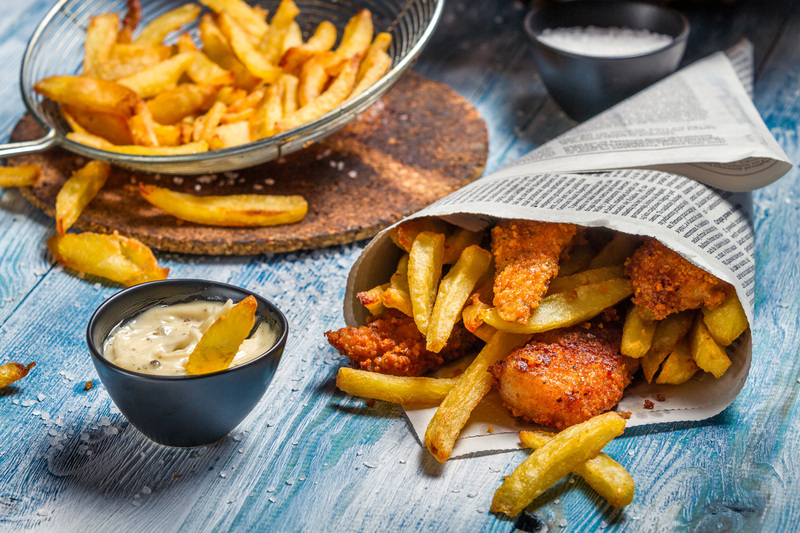 Just like with potatoes, frying adds a lot of calories for fish. You can greatly improve how healthy your meal is by baking the fish and cutting out much of the grease. What baking the fish doesn’t allow for, though, is the traditional batter. It just won’t work as well in the oven. This isn’t a big loss. The batter, especially a traditional beer batter, is calorie-laden. On the other hand, breading your fish with some seasoning and panko creates a flakey, flavorful crust. It’s not quite traditional, but it’s a lot healthier! Mix Aioli ingredients (mayonnaise, Greek yogurt, lemon juice, garlic, and salt) in a small dish. Set aside. Cover two baking sheets with aluminum foil and lightly cover with cooking spray. Peel the skin off the potatoes and cut them in into ½ inch square pieces. Toss the pieces in olive oil and season with salt, pepper, and garlic powder. Place the fries on one of the baking sheets and place in the oven. Cook for 35-40 minutes, turning halfway through and checking the fries every 5 minutes after turning. Mix the panko, salt, pepper, garlic powder, and parsley in a bowl. Beat the egg whites in a separate bowl. Dry the cod fillets and dip in the egg whites. Once both sides are covered, dip the fillets in the panko mixture, pressing lightly on the fillets to ensure both sides are thoroughly covered. Place the fillets on a baking rack over a foil-covered baking sheet. This will keep both sides of the fish from getting soggy. When there are 10 minutes left for the fries, place the fish in the oven. Check the fish after they have been in the oven for 10 minutes. Return to the oven if the fillets aren’t ready. Check after 2 minutes.